Deregulation will remain a central tenet of the USDOT and Federal Highway Administration going forward, explained Brandye Hendrickson (above), FHWA’s deputy administrator, during remarks at the American Association of State Highway and Transportation Officials annual meeting in Atlanta, GA, Sept. 24. 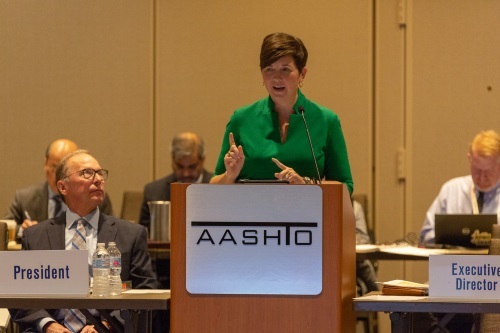 Hendrickson said USDOT so far has 110 planned deregulatory efforts in the works that will generate an estimated $509 million cost savings and she said USDOT expects those deregulatory efforts to exceed $1 billion in savings by end of the year. “This holds the most potential to transform the state/federal relationship,” Hendrickson added. FHWA also plans to explore the possibility of delegating more of its responsibilities to state agencies – an effort it began Sept. 20 with a Federal Register notice that established a new “Special Experimental Project” dubbed SEP-16 to test and evaluate the delegation of program-level responsibilities of the Federal-aid highway program to the states, including the appropriate steps states should take to request to exercise delegated authority. The FHWA said in its Federal Register notice that it “anticipates interest” in state assumption of program-level actions for approval of design standards, noise policies, preventative maintenance programs, and real property acquisitions and disposals.